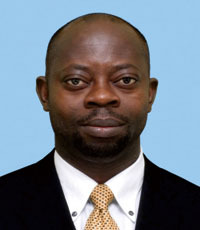 Samuel Amponsah is an associate professor of Economics and Statistics at the Institute for International Strategy at Tokyo International University (TIU). He is the current President of the African Finance and Economics Association and Associate Editor for The Journal of African Development. He has been active as a former Director of the Executive Committee of the African Finance and Economic Association. His research interests are in the areas of health and labor economics, development economics, applied econometrics and statistics, and his research focuses on Ghana and other developing countries. In the summer of 2009, Amponsah was a visiting lecturer at the Research Institute for Languages and Cultures of Asia and Africa, Tokyo University of Foreign Studies, Japan. Prior to joining the Institute of International Strategy, he was a visiting scholar at the Institute of Foreign Studies and the Institute of International Exchange, which are both located at TIU. He is a Monbusho Scholar and was also awarded a JSPS Postdoctoral Fellowship for Foreign Researchers. Amponsah received his M.A. and Ph.D. in Economics from TIU. He is a member of the Japan Association of African Studies, Western Economic Association International, International Association of Agricultural Economist, American Economic Association, African Finance and Economic Association, and The Japan Society for International Development. Amponsah, S. (2017). The impacts of improvements in the delivery of credit from formal and semi-formal financial institutions: Evidence from Ghana. Journal of African Development, 19(2), 33-66. Amponsah, S. (2016). The incidence of health shocks, formal health insurance, and informal coping mechanisms. Perspectives on Global Development and Technology (PGDPT), 15(6), 665-695. Amponsah, S. (2014). Rural-urban disparities, labor market, institutions, and the distribution of income. The Journal of Tokyo International University, School of Economics, 51, 70-93. Amponsah, S. (2013). Adverse selection, moral hazard, and income effect in health insurance: The case of Ghana. Bulleting of Political Economy, Tokyo International University 14, 1-20. Amponsah, S. (2007). The Impact of public investment on economic growth in Malaysia. Bulletin of Political Economy, Graduate School of Economics, Tokyo International University, 10, 34-58. Amponsah, S., & Amanfo, S. E. (2017, January). Efficiency and productivity growth in the health care systems of Ghana: Regional comparison analysis using DEA. Conference paper presented at The Allied Social Sciences Association (Missing Name of Conference). (Missing Location of the Conference). Amponsah, S. (2016, June-July). The Effect of capitation on health expenditure and welfare. Western Economic Association International 91st Annual Conference. (Location Missing). Amponsah, S. (2012). Ghana’s road to universal health coverage: What lessons can be drawn from the experience of Japan. Presented at the Bulletin of Institute of International Exchange, Tokyo International Exchange, Tokyo International University, 45, 14-17). Amponsah, S. (2011). How equitable is the financing of Ghana’s health insurance scheme? Empirical evidence from household survey. Bulletin of Research Institute of Foreign Studies, Tokyo International University, 43, 14-17. Amponsah, S. (2009). Health insurance and household consumption in Ghana: Estimating average treatment effects for the treaded. Northeast Business & Economic Association Proceedings, 36, 9-19. Amponsah, S. (2009). Demand for health insurance and household consumption expenditure decisions in Ghana. Conference of the Journal of Arts and Sciences, 1, 20-35. Koga, K., & Amponsah, S. (2009). Let’s study Akan. Tokyo, Japan: Research Institute for Languages and Cultures of Asia and Africa, Tokyo University of Foreign Studies. ISBN: 978-4-86337-049-49. Copyright © 2018 Tokyo International University All Rights Reserved.